All credit to Jim Kerr who, from the shiny black vinyl of my HMV Norwich 12" and dressed in a shiny blue suit, pre-emptively implored us to get on down To The Waterfront. We'll cover Go West another time. Move On Up, he continued, and to be sure the skyline is surely shooting up down there on the docks. Flats, apartments and other garden-less dwellings abound, as do places of refreshment. I cycled past the in-progress Dance East tower and bypassed Pizza Express -- whoops, there goes Jamiroquai's wing mirror -- then Bistro On The Quay, Il Punto, Isaacs, the Salthouse and Colours. We're directly underneath the Nepture Marina (name copyright Gerry Anderson) development off the fantastically fossil-named Coprolite Street, and next to the impressive UCS building. A prime spot. Making use of some handy bike lock railings, in we go to Coffeelink. Must have been here a couple of years now, this place. Doesn't look over-inviting, though p'raps that's the building's fault. Counter is dead ahead with a smattering of tables to the right, and you could easily think that's it. However, the left hand wall becomes a small flight of stairs leading to a much lighter & airier space, with tables, some books, a magazine or two, and a three-quarters decent view of the docks. Already here, tucking into a monster slab of carrot cake, is Greenroutes Andy. No Mr Scott today: v. little free parking in this vicinity. Place is pleasantly peopled with mums, suits and studes. Atmosphere is good. Small-ish savoury selection of soup or sarnies. Mine's a pepperoni panini plus kettle chips. We've got the prized window seat which, like a top parking spot, you're reluctant to leave. 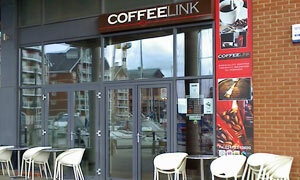 Big plus point is that Coffeelink is open to 8pm most days, very much unlike Costa and Starbucks in the town centre. Andy, shortly to depart this country prior to Obama's arrival, tells me that WiFi isn't free: tut tut. On t'other hand, they *do* sell two varieties of Ritter Sport chocolate, making that dessert choice ever tougher. Ultimately, it's the chocolate cake that wins out. They pride themselves on the coffee here; they've got their own roastery, natch. When I order a double macchiato, the bloke says: "Have you had this before?" Not here, I haven't, though I'll certainly be back for another, possibly to sit outside in a T-shirt and shorts, watching trains and boats and planes. Well, boats. If it was a car -- Kia Soul.